Parks &amp- Trails New York, the New York State Trails Council, and the New York State Office of Parks, Recreation, and Historic Preservation have announced the results of a New York State Trail User Count. 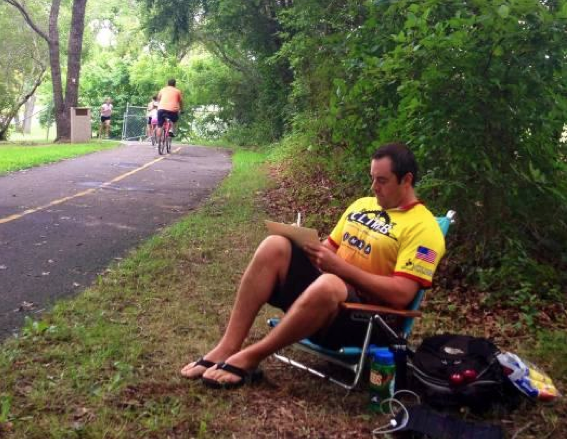 The study focused on 14 of the state’s greenway or multi-use trails where volunteers conducted user counts this past August. Based on the results of these counts it is estimated that over 2.2 million cyclists and pedestrians are using these trails each year. Parks &amp- Trails New York (PTNY) and the Canalway Trails Association New York (CTANY) have released their third annual report, Closing the Gaps: A Progress Report on the Erie Canalway Trail 2012. &#8220Since PTNY and CTANY launched their “Closing the Gaps Campaign” in 2010 in conjunction with U.S. Senator Kirsten Gillibrand, interest in completing the Erie Canalway Trail among citizens, community leaders, and local, state and federal government officials has reached an all-time high,&#8221 the groups said in a press release announcing the annual report. Visitors to the Erie Canalway Trail this summer may encounter students wanting to know more about their visit as part of a an economic impact study being conducted by the statewide not-for-profit advocacy group, Parks & Trails New York (PTNY). Paul Scipione, Ph.D., Professor Emeritus of Business and Director of the Survey/Research Center at SUNY Geneseo is leading the eight-month effort. Throughout July and August, Dr. Scipione and his team will survey 600-800 current trail users to gather data on demographics, trail usage and spending patterns, and overall trail experience. Approximately 30 SUNY Geneseo undergraduates who live within the Canalway Trail corridor will administer the survey to persons selected randomly at multiple points along the trail. In addition, students will be noting the number and nature of trail users as part of an expansion of the annual Erie Canalway Trail count. Students will also survey local business owners and government, economic development and tourism officials. 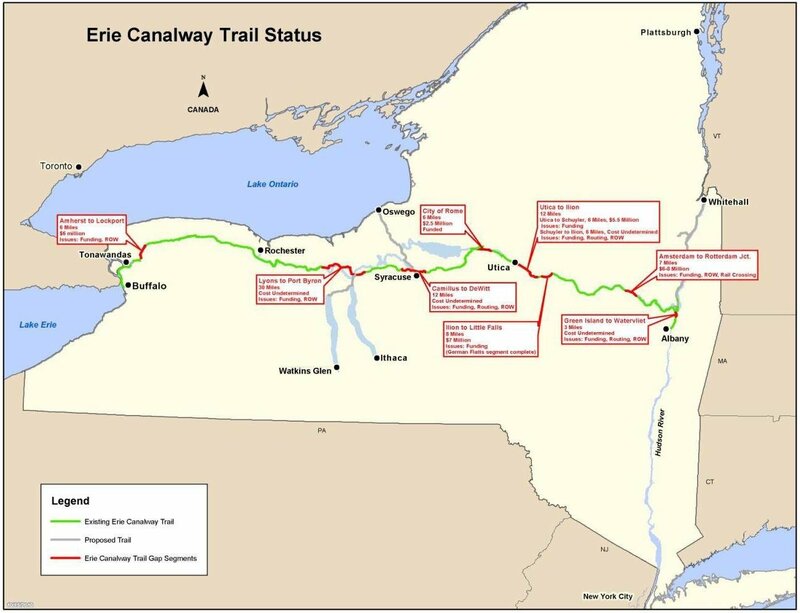 The information obtained from the surveys will be used to ascertain current and potential economic impacts of the Erie Canalway Trail on New York’s economy, in terms of dollars as well as jobs generated and sustained. Study results will be published in early 2013. “We are certain the Erie Canalway Trail has a positive effect on the economy of hundreds of local communities, but we don’t presently have statistically valid data to back that up. We look forward to receiving the survey results and sharing them with business owners, elected officials, and community residents,” said PTNY Executive Director Robin Dropkin. Dr. Scipione has directed more than 1,000 research studies, a number of which have dealt with travel and tourism, recreational venues and the measurement of quality-of-life issues. Parks & Trails New York is the leading nonprofit organization, working since 1985, to expand, protect and promote a network of parks, trails and open space throughout New York State through advocacy, outreach, technical assistance to communities, and promotion of bicycle tourism. 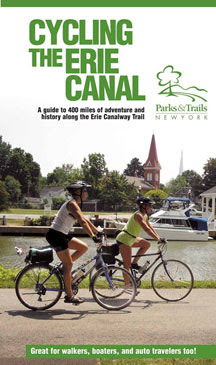 For more than a decade, PTNY has actively promoted the Canalway Trail through its annual Cycling the Erie Canal tours- popular guidebook, Cycling the Erie Canal: A guide to 400 miles of adventure and history along the Erie Canalway Trail– and interactive on line version of its guidebook. PTNY has also worked with local business people and elected officials to attract and meet the needs of bicycle tourists in their communities through its Bicyclists Bring Business workshops and guidebook, Bicyclists Bring Business: A Guide for Attracting Bicyclists to New York’s Canal Communities. For more information, go to www.ptny.org. The study is funded in part by the New York State Canal Corporation and the Erie Canalway National Heritage Corridor. This week Governor Andrew M. Cuomo announced $89 million for in New York Works funding for capital improvements at 48 specific state parks and historic sites that account for 37 million of the park system’s 57 million annual visitors. The state budget signed last week also includes $35.6 million in total funding for the New York State Council on the Arts grants, an increase of $4 million. The Environmental Protection Fund is unchanged, at $134 million which includes 9M for the Zoos, Botanical Gardens and Aquariums Program and additional monies for some historic preservation projects. According to the Museum Association of New York (MANY), there are no cuts in jobs or programs at the state Office of Parks, Recreation and Historic Preservation, but &#8220Parks would be down 12 jobs, to 1,736, reflecting attrition and the ongoing hiring freeze.&#8221 Funding to run the parks would dip slightly, about 2.5 percent, to $211.3 million according to MANY. According to a press statement issued by the Governor’s office, New York Works is designed to reinvent state economic development with innovative new strategy that will put New Yorkers back to work rebuilding the state’s infrastructure. The Task Force is expected to help create tens of thousands of jobs by coordinating comprehensive capital plans, overseeing investment in infrastructure projects, and accelerating hundreds of critical projects across the state. Parks & Trails New York was among those who reacted enthusiastically to the New York Works plan. Through a series of reports over the last few years, Parks & Trails New York has attempted to document the challenges facing the New York State Office of Parks, Recreation and Historic Preservation (OPRHP), particularly the agency’s enormous capital projects backlog, and the economic benefit the park system generates for the people and economy of the Empire State. On a statewide basis, Parks & Trails New York reports that direct spending by OPRHP and spending by visitors to state parks supports up to $1.9 billion in output and sales, $440 million in employment income, and 20,000 jobs. The benefit-to-cost ratio is more than 5-to-1—more than $5 in benefits for every $1 in costs. A detailing of projects in each region of the state can be found by using the Governor’s press releases here. Cycling the Erie Canal is a resource for cyclists planning to bike the entire route as well as for riders looking to enjoy an afternoon on the trail. It is also useful for walkers, hikers, in-line skaters, boaters, and auto travelers who want to enjoy the trail and some of the historic and cultural sights along the route. The 144-page guidebook includes 42 full-color maps and more than 100 color photos that detail the trail route, as well as the things to see and do along the way. In addition to parks, museums, historic sites, and visitor centers, the maps indicate lodging and bike shops. Services such as restaurants, convenience stores, ATMs, pharmacies, post offices, hardware stores, and parking areas are also shown. Cycling the Erie Canal includes interpretive information about the history of the canal, plus tips on cycling, travel, and trip preparation. A spiral binding, and 5” by 9” size make the guide convenient to carry. The Erie Canalway Trail route runs east-west between Buffalo and Albany and follows both active and historic sections of the Erie Canal. At a meeting of the Senate Committee on Cultural Affairs, Tourism, Parks and Recreation today, Parks Commissioner Carol Ash told Committee members her agency is going ahead with plans to close 55 parks and historic sites, and curtail programming and services at an additional 22, unless sufficient funding is restored to the budget of the Office of Parks, Recreation and Historic Preservation in the final state budget. State Parks needs $6.3 million to keep open the 55 parks. The fate of an additional 52 parks and historic sites, 34 tagged for closing and 18 for service reductions, is tied to a $5 million Environmental Protection Fund appropriation in the executive budget. In total, State Parks needs $11.3 million to prevent any park or historic site from closing. In their budget proposals, the Senate and Assembly have committed to keeping all NYS parks and historic sites open this season. “We’re alarmed that the late budget is putting parks in limbo. Will the 55 parks and historic sites slated to close ever be able to open this year? By the time the budget is passed will there be enough time for the parks agency to get the facilities ready for the season? What if the budget doesn’t pass until June?” questioned Dropkin. “Should agreement on the final state budget continue to be delayed, the Governor and Legislature need to come up with an immediate solution to keep state parks open and accessible to the public,” said Dropkin. Every dollar invested in state parks and historic sites generates $5 in economic activity for the surrounding communities. In 2008, state parks and historic sites generated $1.9 billion in annual economic activity, including supporting 20,000 long-term sustainable non-parks jobs that generate tax revenues far above the amount of the proposed cuts. The system’s 178 state parks and 35 historic sites, encompassing 325,000 acres of land and water from Montauk to the Thousand Islands and Niagara Falls, collectively draw more than 56 million visitors a year, 40 percent of whom come from outside the immediate area. In the 125 years since Niagara Falls State Park became the first state park in the nation, New York State has never closed a park, not even in the depths of the Great Depression. Parks and historic sites on the governor’s hit list for closure affect every region of the state, from Orient Beach State Park at the tip of Long Island’s North Fork to Wilson-Tuscarora State Park in Niagara County. Patronage of parks and historic sites has been increasing each year, especially as the current recession leads financially strapped New Yorkers to seek recreational opportunities closer to home. 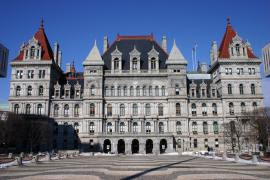 “It is incumbent upon legislators and the Governor during budget negotiations to restore $11.3 million, a mere four-thousandths of one percent of the state budget, to the parks budget to keep our unparalleled system of parks and historic sites open and accessible to the people of New York,” said Dropkin. Ed. &#8211 New York History reported on the potential for these closings in February.